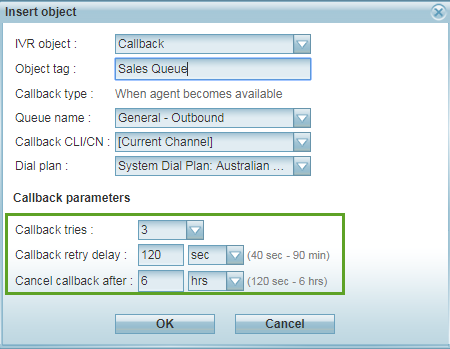 Increased callback time: The cancel callback time can now be set to an increased maximum of 6 hours. The requested callback remains in an outbound queue for the duration of that time until the specified time. Any callback attempt is prevented after the time expires. The callback request is removed from the outbound queue after Cancel Callback duration has expired. Improved granularity for callback retry delay: You can now set callback retry attempts using hours, minutes, and seconds. Previously, you could only set it up in seconds. Improved granularity for Cancel callback after: You can now set the time duration to cancel call back using hours, minutes, and seconds. Improved efficiency for selecting the callback channel number: Using the new option [Current Channel] for CLI/CN, you can now display the original channel number, which the caller used as the caller ID for the callback. This option is selected by default. If you wish to display any other channel number during the callback, you can select from the list of available channels. Click to edit an existing script. In the Scripts > Phone > Script, click to add the Callback object.